What is Skip Logic for? You may have a scenario when asking questions in your survey that will allow you to either skip or answer certain questions in order to improve the survey performance. This can be called Skip Logic or alternatively you may know this as conditional logic / questioning or branch logic. All you need to remember, is that Skip Logic is applied for certain questions that require the respondent to make a choice in their answer. 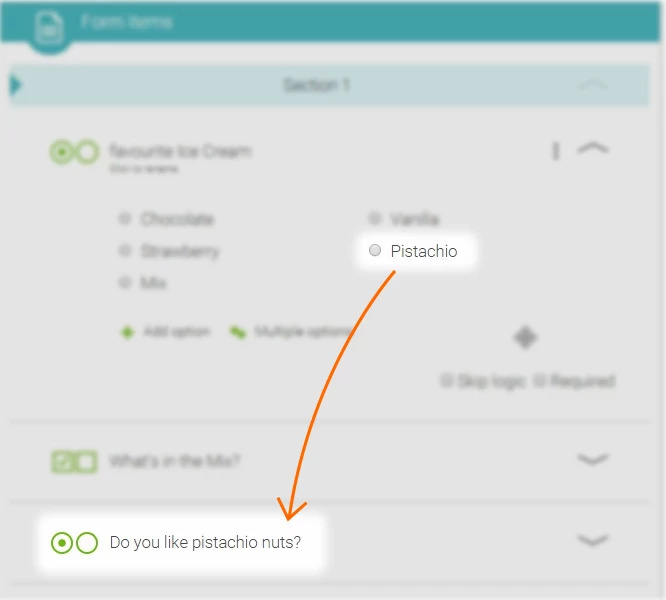 If the respondent picks “mix”, this gives you the opportunity to ask a follow up question or skip other questions that may have been related to the other flavours. For this example, If “Mix” was chosen, you can then ask for a detailed description of the “Mix” flavour of choice. How to set Skip logic with Nest Forms? First, you Must add one of the components that supports Skip Logic (Single Answer, Multiple Answer or DropDown) - lets call it key question. Add all the following questions you want to ask in your survey. Then when you mouseover any of the question option, you will see a new icon appear . When you click on the link icon, you can choose which question should then appear when this option is selected. This question will appear only when the previous option (within the key question) is selected. You can also set the skip logic function to multiple sections. This might be suitable when there are multiple questions asked about one topic and if this topic is not relevant based on the previous answer. When applying Skip Logic, you can simply select the relevant component or sections that you wish to appear only when the current response is selected. Have a look at the graphic below to see a demonstration. And this is the behaviour of skip logic when filling the form on your mobile. The logic within NestForms is that the finish button is always automatically added to the last “non skippable” section to always allow the user to finish the Response correctly. Are you having a problem where the finish button is automatically added to an unwanted page? Then we recommend creating a final section, which can act as an end to the form that denotes where the form ends, allowing the form to finish outside the Skip Logic part of the form. This can simply be called “Final question” or “Summary” or anything similar that works for you. It is very important to add this final step to ensure that the “Finish” button will always appear at the end of the form.